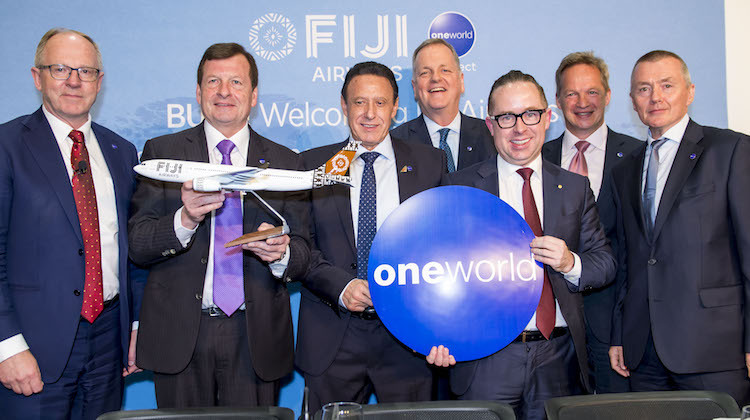 Fiji Airways will be the first airline to join the oneworld marketing alliance under a new “oneworld connect” category. The airline’s entry into oneworld is being sponsored by American Airlines, British Airways, Cathay Pacific and Qantas, with the latter also mentoring Fiji Airways’ integration into the alliance. It was officially unveiled at the International Air Transport Association annual general meeting being held in Sydney. The oneworld connect membership category allows airlines that wish to join the alliance but do not have either the resources, or need, to offer full reciprocity of frequent flyer benefits and integration with the rest of the full oneworld membership the opportunity to do so. oneworld chief executive Rob Gurney said the traditional full membership – which has been the only type of membership offered since oneworld was formed two decades ago – that required total reciprocity across all oneworld members was an investment of the scale a declining number of airlines could undertake or regard as worthwhile. By contrast, oneworld connect member airlines will offer a limited suite of passenger benefits for eligible frequent flyer benefits for all oneworld member airline passengers, as well as a second set of benefits to airlines that have helped sponsor its entry into the alliance. Airlines will require a minimum of three sponsors to join as oneworld connect member. “The pool in which we are fishing now in terms of potential new carriers that fulfil that description is quite limited,” Gurney told reporters during the official announcement on the sidelines of the IATA AGM. “What oneworld connect enables us to do is bring other airlines into the oneworld family, airlines that don’t need our sort of historical membership requirements. Fiji Airways chief executive Andre Viljoen said the airlines ascension into oneworld as a oneworld connect member meant the airline would be able to offer “more services and benefits to our own customers along with the others in the oneworld family, to achieve a greater presence for our airline internationally and to build on the inbound tourism that is so vital for our home nation”. 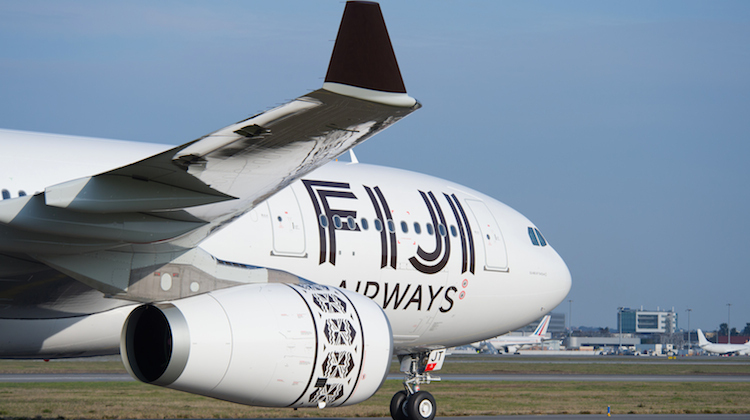 “It is also a matter of great pride for us at Fiji Airways to link the South Pacific to the oneworld network, in effect one of the world’s final frontiers for travel is now connected,” Viljoen told reporters. International Airlines Group (IAG) chief executive Willie Walsh, representing British Airways, said he was delighted to be supporting this initiative. “The global alliances will need to continue to evolve if they are to remain relevant in this fast-changing industry and that is exactly what oneworld is doing with today,” Walsh said. 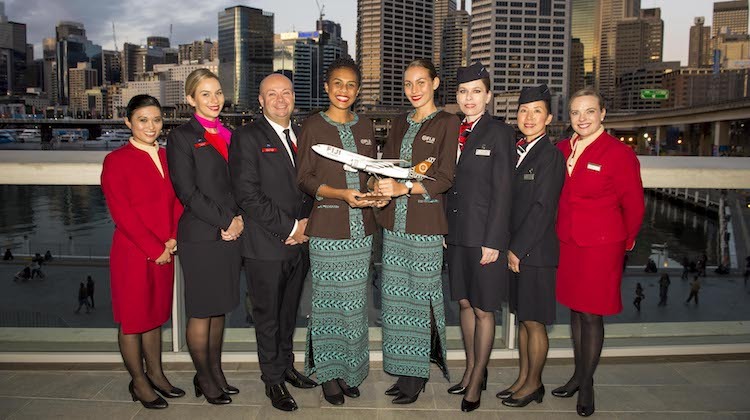 In addition to sponsoring Fiji Airways’ entry into oneworld as a oneworld connect member, Qantas is also mentoring the airline in its implementation process. While Fiji Airways is majority government owned, Qantas holds 46 per cent of the airline. A number of governments in the South Pacific also have small stake in the airline formerly known as Air Pacific. Qantas, as well as American Airlines and Cathay Pacific, also has existing codeshares on Fiji Airways’ services, including between Australia and Fiji. “Our friends will add great value to the oneworld network. It gives a destination that we think a lot of our customers around the globe will want to actually travel to,” Qantas chief executive Alan Joyce said. “Secondly, it really builds on what we think is amazing demand from Australia as an example. Under the oneworld connect model, Fiji Airways would offer priority checkin and priority boarding for all eligible members of oneworld frequent flyer programs. Meanwhile, a subset of benefits, including earning points and status credits, access t0 lounges and through checkin of bags and passengers would be offered to eligible frequent flyers members of oneworld carriers helping sponsor Fiji Airways’ application to oneworld connect membership status. As noted earlier, the four sponsors are American Airlines, British Airways, Cathay Pacific and Qantas. oneworld said it was in talks with other carriers from Asia Pacific, the Americas and Europe. “oneworld connect provides a way of enhancing relationships between these new partners and oneworld and its member airlines going forward with a streamlined and rapid path to full membership later on where that makes sense for all parties,” oneworld chairman and Finnair chief executive Pekka Vauramo said. The oneworld connect scheme has similarities with the Star Alliance connecting partner model, which allowed airlines to be involved with the alliance without becoming a member. “Connecting Partners have full commercial links with three or more member airlines, but not with all 28 members,” is how Star Alliance describes its connecting partner model on its website. Juneyao Airlines was named the first Star Alliance connecting partner in May 2017.